NOVEMBER 2017; JESSUP, MARYLAND: It has been one year since API's TranZformer Series guitar and bass pedals first debuted at AES 2016. The product was groundbreaking for API, already renowned for its world class analog consoles, modules and rack gear. The aim of the TranZformer Series is to bring the legendary API sound directly to the guitar and bass by incorporating API's traditional signal path. 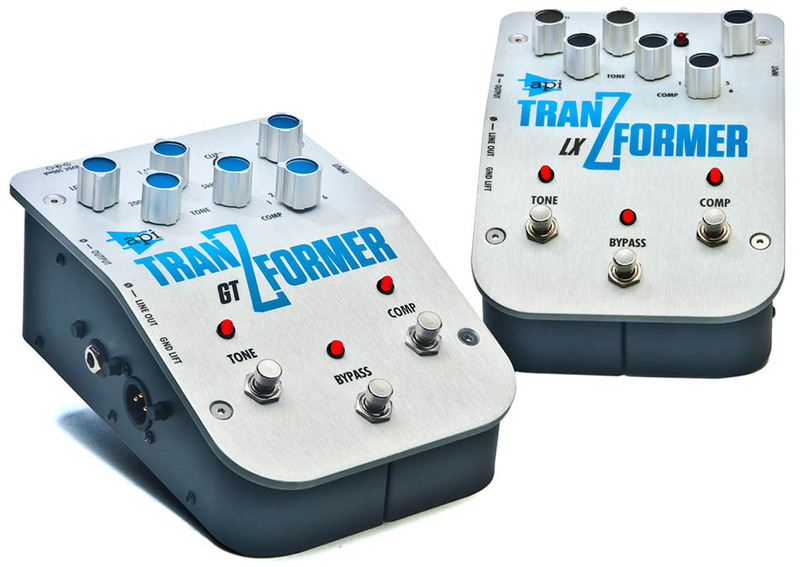 Both the TranZformer GT Guitar Pedal and the LX Bass Pedal provide gain control, compression and equalization in one box, and have gained unanimous praise from critics, studios, and touring musicians alike. Acclaimed bassist Dave Roe, who has worked with the likes of Johnny Cash, Loretta Lynn, Chet Atkins, and Carrie Underwood, had nothing but praise for the TranZformer LX. "I was introduced to the TranZformer pedal at House of David Studios in Nashville," said Roe. "This facility has an old API console that a lot of us musicians here in Nashville think is the premier board in Nashville, especially us bass players. They asked me to try this DI pedal and it was scary how well it stacked up next to playing through that console, which is what I love to do when I work there. I’ve used it flat, as well as with the comp and EQ. It offers three awesome options right there alone. I can’t say enough about it. It’s in my car with me on the way to everywhere I work now." The TranZformer GT has likewise become a favorite of Bouncing Souls guitarist Pete Steinkopf, who often uses the pedal live. Additionally, celebrated bassist Victor Wooten employed the TranZformer LX on his latest album Trypnotyx. Musician and Producer Jakob Morelli, who has played guitar for Ed Sheeran, Bruno Mars, Roberta Flack, and The Roots among others, is equally impressed with the TranZformer GT. "I can't believe how sweet my tone is now," Morelli says. "It's unbelievable!" API is proud of the TranZformer's success in its first year, and is convinced that its reach and presence, both in studios and on the road, will continue to expand in the year to come.